The WT3000E Transformer Version is the world's most accurate power analyser, ensuring high accuracy, precision and stability at very low power factors. With almost 100 years of experience and leadership in measurement, Yokogawa enables manufacturers to develop the next generation of transformers with lower life-cycle costs. You can view a sample accredited calibration certificate here. Read the full customer testimonial on the WT3000T precision power analyser here. The WT3000E Transformer Version is the world's most accurate precision power analyzer, offering the best accuracies at low power factors for commercial frequencies of 44 to 66 Hz. Even at power factors as low as 0.01 at 100 V and 1 A, the WT3000E Transformer Version offers an accuracy of 0.5% of the reading. This makes the power analyzer ideal for the precision testing of transformer losses according to the IEC60076-8 standard. As shown in the accuracy specifications in the brochure, the WT3000E Transformer Version goes above and beyond the industry expectations by calibrating at power factors as low as 0.001. When small loads are connected to the potential transformers, the WT3000E Transformer Version directly supports both the standard formulas used to calculate the correct power. These functions compensate for the loss caused by the wiring of each element. The WT3000E Transformer Version provides the following three types of correction functions to measure power and efficiency. These compensation functions enable the WT3000E Transformer Version to measure power accurately and precisely. 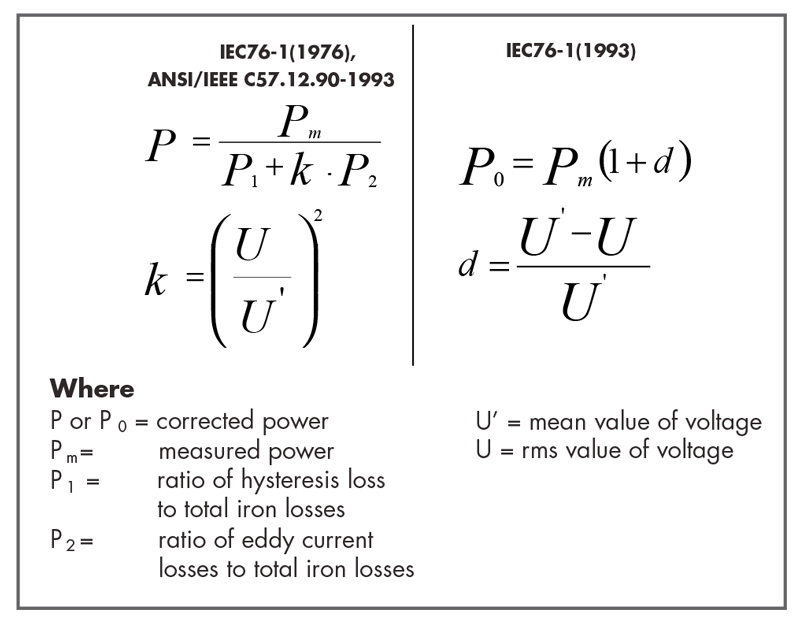 confidence in the measurement of power losses, particularly under no load conditions and power factors as low as 0.01. To address this, the WT3000E Transformer Version is calibrated, tested and measured at 53Hz at power factors of 1, 0.5, 0.05, 0.01 and 0.001. This enables the integrated transformer measurement system to measure power losses with great accuracy and capture any drift outside the limits described in the IEC60076-8 standard. As the only ISO 17025 certified non-governmental organization that offers calibration up to 100kHz, Yokogawa is uniquely equipped to guarantee the power accuracy specifications of the WT3000E Transformer Version and improve upon it with calibration. You can view an accredited calibration sample certificate here. More on accredited power calibration up to 100 kHz, click here. For more details, please download the brochure.